California State University, Northridge biology professor Steven Oppenheimer is celebrating 23 years of collaboration with Los Angeles Unified School District (LAUSD) teachers to promote science, technology, engineering and mathematics (STEM) research done by K-12 students with the debut of volume No. 23 of The New Journal of Student Research Abstracts – on Dec. 19. A symposium scheduled for 1 p.m. on March 10 at CSUN’s University Student Union will feature the work of hundreds of participating LAUSD students. The annual symposium brings together CSUN faculty, teachers, students and parents to celebrate their science projects. “Students receive medals, and when the kids hear their names [called], the cheers are louder than any baseball or football game,” Oppenheimer said. The journal is composed of several different research topics like “organic vs. nonorganic apples,” “testing PH level of different brands of water” and do video games improve your reflexes,” to name a few. The New Journal of Student Research Abstracts was first published in 1995 and was designed to help educators come up with creative research materials and ideas for their classrooms to engage students in scientific research. Over the years, the journal has garnered numerous awards for its outstanding impact on young science students. The accolades have included the CSUN Delmar T. Oviatt Library Open Access Award, the Presidential Award presented by President Obama at the White House and, most recently, the Ed Peckham Award presented by the CSUN Alumni Association. 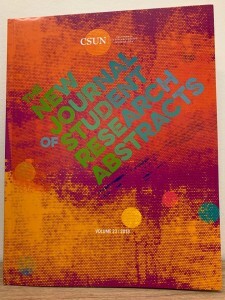 All 23 volumes of the journal are available online for free and can be accessed by visiting: http://scholarworks.csun.edu/handle/10211.3/206671.